The 2019 Busch Softball Classic will be held on July 5 - 7. It has become a lasting testament to the wonderful sport of softball. The Busch Softball Classic is about to start its 40th year. Founded in 1979 as a fundraiser for a class A team from Arkansas, the Classic had humble beginnings with 32 teams. 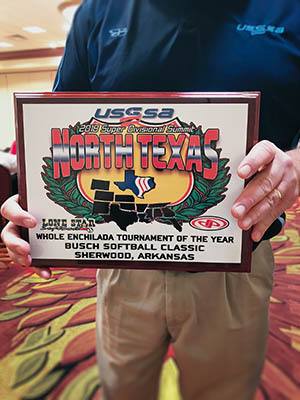 Now over 2,700 teams from 39 states have participated and the tournament has grown into a softball showcase of fiercely competitive men's & women's teams of all classifications from all over the USA! Some of the greatest players, coaches, & sponsors ever known have been a part of this event. Our formula for success has been organization, quality umpires, beautiful fields, lots of prizes, and top flight competition. We are proud to be celebrating 40 years of the Busch Softball Classic! Congrats to our 2018 winners and MVPs! We're also the proud owners of an award! What an honor! Thank you so much! For a list of 2018 winners and photos, click here. More than 100 men's and women's teams compete in five different divisions during this annual tournament.